Keeping your Rent Rolls current is a key component of the budgeting process and will go a long ways towards ensuring your Property and Portfolio dashboards are accurate. The schedule of rents from the Rent Roll is what Stessa uses to populate the Income calculations on your Property and Portfolio dashboards. The Rent Roll card is located on your Property dashboard, just below the photos. If you're looking at a dashboard and don't see a Rent Roll below it, you're probably looking at a Portfolio dashboard. Scroll down and click an address to go to the chosen Property dashboard. How Do I Edit the Rent Roll? 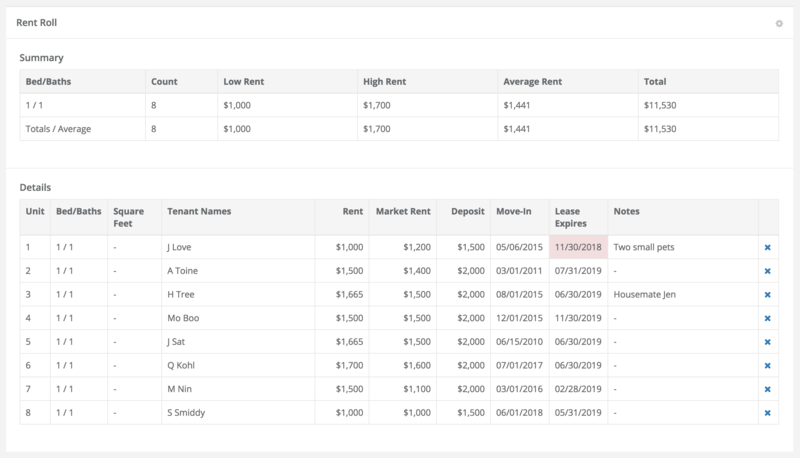 You can update unit numbers, rents, deposits, move-in dates, lease expirations, and more directly in the grid by clicking on the field you want to update. To add new units to the Rent Roll, just click the small gear icon in the right corner and select "Add Unit." To add projected income from parking or laundry, use the same gear icon and select "Add Other Income Source." Use the blue "x" in the right column to delete a unit or income source. If your Rent Roll is long and complicated, you can download a CSV file for offline editing and then upload the revised version to save time. Use the same small gear icon in the right corner to accomplish these tasks. Note that we're currently developing a more detailed Rent Roll feature that will allow you to preserve historical lease/rent data by unit. Currently, when a tenant moves out and new one moves in or a unit becomes vacant, it's best to simply overwrite the existing data for that unit directly in the Rent Roll. What If I Do Short-Term Rentals? If your Property is set up primarily as a short-term vacation rental, we recommend inputting an average monthly income amount into the Rent Roll, based on your last 12 months of data. This will smooth over any seasonal changes in your rents and occupancy, and give you a valid baseline for budgeting. Still have questions about the Rent Roll?